Your hair – or lack thereof – says a lot about you. 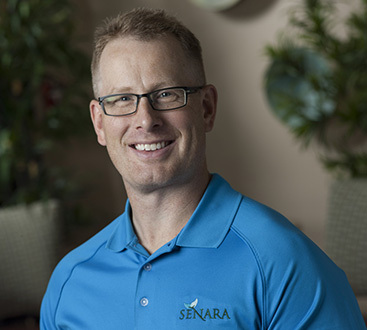 Senara Men’s Health Center in Peoria, IL offers treatment options for both Hair Restoration and Hair Removal. It’s about putting the hair back where you want it and removing it where you don’t. Our specialty is in natural hair growth and hair removal solutions. No pills or harsh chemicals, just treatments that are both safe and effective. Whether you are looking to just rejuvenate hair growth on your scalp, or remove excess body hair for a well-groomed look, Senara can help. Hair loss in men is a common occurrence with the aging process. For some, the hair loss can create issues of self-confidence. Whether you are experiencing typical male pattern baldness, general thinning of the hair, or symptoms of alopecia, there are solutions available to regrow your hair. Senara Men’s Health Center specializes in holistic hair regrowth options. We offer minimally-invasive PRP Hair Restoration treatment, and non-invasive TheraDome® laser therapy. Our physicians will prescribe the appropriate combination of both PRP and TheraDome® treatments to stimulate new hair growth. Let’s be honest. Even though the hair on the top of your head may be diminishing, it’s out of control everywhere else. Like your ears. Or your brows. Or your back. It can get out of control faster than you realize, and next thing you know, you swear you see a Wookie reflecting at you in the mirror. Sound familiar? Senara Men’s Health Center has options for hair removal to clean up your body hair. We offer traditional waxing services for routine maintenance and non-invasive laser hair removal for a permanent reduction in hair growth. To request an appointment or consultation for any of our Hair Restoration or Hair Removal Treatments, please contact us at (309) 245-1995 or fill out the form below. Appointment requests are typically responded to within 24-48 business hours.